Buying PLR blog content saves time and money, that is a fact. One pitfall is if 100 licenses are issued, there’s a small possibility all will publish it on the web. Often I’m asked how to use done-for-you content? How can I make it sound like my voice? How can I make it original enough so it’s not like everyone else who bought it? 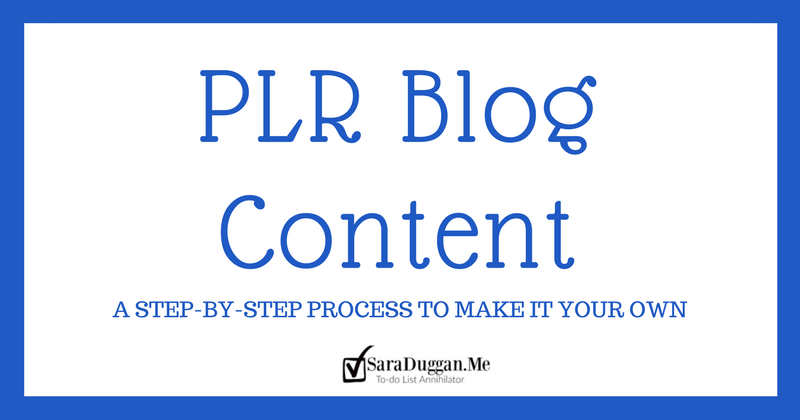 A step-by-step process to make PLR Content sound like YOU. The first step to using done-for-you content is to buy it. Not sure who to buy from? Read this post with my Top 10 PLR Providers. Choose a topic, opt-in to receive your free PLR and download it. The sample I’m using to demonstrate the content transformation process is Disaster Preparedness* provided by PiggyMakesBank. Once you buy your content, unzip the file and review all the pieces. Some packages just have articles others include Tweets, images, and infographics. Before starting I highly recommend you make a backup copy. You don’t want to make changes to the original or accidentally delete it. –>> Side Note: This is a perfect time to sign up for Sue’s of BuyPLRToday’s 30DayPLR challenge. * Lots of great information on organizing and using PLR. After you buy your blog content, unzip the file, and review all the pieces, select one piece to use. I’ve selected Five Must-Have Supplies That Should Be Part Of Your Disaster Preparation. Now, read through the entire text. Does anything stand out to you? Does an expert come to mind? How about a famous quote? Do any products jump out at you? This piece mentions water, non-perishable ready to eat food, weather radio, flashlight, batteries, and a first aid kit. Over the summer I started storing water. I cleaned old plastic containers, filled them, taped them shut, dated and stored them. To my surprise, mold started growing inside the bottles. I had to pour out all the water and recycle all the bottles. My water storage efforts were in vain. Knowing my real life experience, I want to 1. know how to safely store water and 2. warn others of my unsafe discovery. This is a perfect story to add to this content. I’d also research storing water safely. Products that come to mind are solar radio, water filter, solar lamps, flashlights with batteries taped to the side, edible non-perishable food sources, and first aid kits. (special needs, allergies, health issues). I haven’t written a thing. This all came to mind as I read the PLR blog content. First thing, make a copy. I’m pointing this step out twice because there’s nothing like losing paid content. I bought a package of 52 emails, articles, and a short report as well as over a hundred products on a dime sale. All of it disappeared into the ether when my computer’s hard drive crashed. Next, upload the articles into your WordPress drafts and save. All that’s left to do is transform and publish. Grab this checklist of questions to ask when transforming content. There certainly a lot more you can do, but this will get you started. Sara? How does this save time and money? I’m still writing. Wouldn’t it be easier to hire a writer? Yes, you’re still writing. And, yes, I believe it’d be best to hire a content writer. Based on client’s I’ve worked with, this is the best alternative for microbusinesses with tight budgets. Further down the road, after the initial startup phase, I do advise hiring a team of content writers. It may seem counterproductive to start, but give it time. It does save time and it does save money. Imagine sitting down to write a blog post. You open up your WordPress dashboard, find a draft post (PLR blog content) and you hit publish. Okay, honestly, it’s not that quick. Before you hit publish you’d do some keyword research, add some social triggers, format the post, create and add images, and add a story or example. Statistics or expert quotes are good additions too. But, you can save yourself time by hiring out the management (like researching keywords, formatting, and image creation) to a virtual assistant. As you can see, using PLR content in your business can save time, money, and even your sanity. You do have to be smart about where you buy your content. This is the exact process I use to rewrite PLR blog content for clients. Would you like to learn or have your virtual assistant learn? I’m hosting a Get It Done Day later this month. 4-hours of virtual co-working. Together we’ll transform your done-for-you content into 30 social media posts and images, 5 blog posts, 5 email messages, and even a short report. Learn More Here. Dear Readers, thank you for reading. If you found this to be informative, why not share it with a friend or colleague? The entire 31-day series can be found HERE. Saving time is easy, just pack everything into 24-hours a day. You Got This!